I accidently clicked on the add warband button. I did not find a minus button or right klick on the warbands does not work to cancel the action. Can you please add a possibility to do this? A Cancel / Minus Button right click whatever. What have i missed looking at, if it's intended to work this way? it is a bit hidden but there. You can hover any warband button to see more options. On the left there is an double arrow button to expand the group to see what is in, but this also to reveal more warband controls. Now you see from left to right Cancel Rally Flag button (striked rally flag), Dismiss Warband button (x symbol), Add to Warband button (+ symbol), and Remove from Warband button (- symbol) and all units in it on the right side. Many thanks! 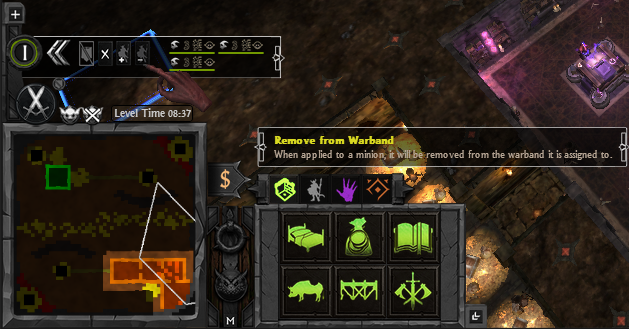 The "disband warband" button was exactly I was looking for. Alright then I will reject this report as it is no bug.